At Overhead Crane & Conveyor Services, we have been helping customers select the ideal crane for their application for over 30 years. We offer Jib Cranes from three regionally located Jib Crane manufacturers; these are trusted vendors and their expertise and precise manufacturing methodologies have made them industry leaders. The diversity of this resource allows us to utilize their vast combined knowledge base to provide the most efficient and cost effective solution, maximizing ROI. Jib cranes seem simple enough, a column and/or a compression mount that supports a cantilever arm, which is capable of 360° rotation. 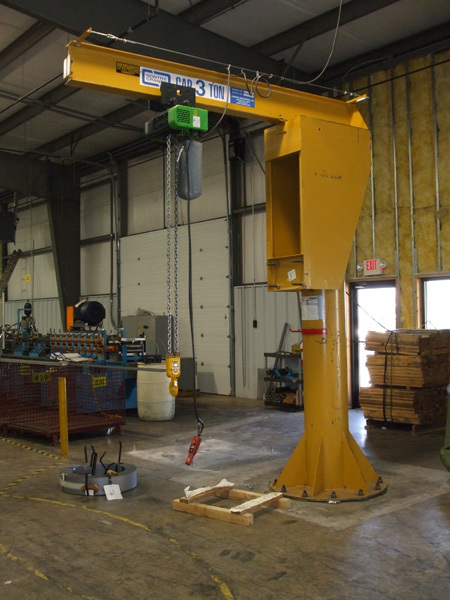 What is not immediately apparent to most is that base mounted Jib cranes require a counter balance sufficient to handle to rated load; this means a tremendous amount of concrete and expert planning. In some cases, the base may be more expensive than the crane itself. That is why determining the right crane type for the application is a critical first step. Our success as installers and designers of complete systems means that we are a single source solution, and understand the complete crane system. In addition to this important value added service, we also provide all electrical components such as bus ducts, cable reels, festoons, and C-tracks. We also perform exhaustive functional and load testing to verify conformance to internal quality standards and customer specifications. In addition to jib cranes, we produce numerous types of exotic cranes such as shipyard, portal, and rigid mast stacker cranes. Shipyard cranes are designed to accommodate the unique needs of the shipbuilding process and provide maximum safety and efficiency during the construction of barges and ships. Portal or gantry style cranes have the ability to operate apart from walls or rigid columns, making them very versatile for a variety of industrial and outdoor applications. Rigid mast stacker cranes are used in automated material handling applications to efficiently retrieve pallets from high bay storage with minimal operator interaction. We have a wealth of experience in the design, fabrication, and installation of all types of cranes and other industrial material handling equipment, and can assist customers in developing the ideal solution for their specific application. For additional information about our ability to design and install Jib cranes or exotic cranes, see the table below or contact us directly.